The PDL Mid South Division enters the final week of the 2018 regular season schedule with three teams in title contention and faint hopes that the second place team in the Southern Conference playoffs can come from the Mid South. The three Mid South Conference divisional champions and best second place team will advance to the Southern Conference playoffs, to be played July 20-21 in Statesboro, Georgia at the home of undefeated South Georgia Tormenta FC (already qualified as Deep South Division Champions). Three teams remain in contention for the Mid South Championship-current standings leader Brazos Valley Cavalry, Texas United and OKC Energy U23. The final week features six matches, including a grueling three for OKC Energy U23, who play back-to-back home games this weekend to finish their regular season. Brazos Valley Cavalry and Texas United, the other two title hopefuls, play a home-on-home series, the first in Grand Prairie on Tuesday night. Two first half goals from FC Dallas Academy product Giovanni Montesdeoca led Texas United to a convincing 4-1 victory over AHFC Royals. Killian Colombie scored late in the match for the Royals to prevent the shutout. The Cavalry continued their recent hot streak when Angel Paita scored 4 goals to lead the Cavalry to a 6-2 thumping of FC Cleburne on the road. Killian Colombie’s early second half goal, his second of the week and 10th of the season, was the difference as the Royals defeated cross-town rivals Houston FC 1-0. The Royals won the season series between the two clubs…winning two of the three played, both at home. Corpus Christi’s Gabriel Quesada’s 50th minute goal offset a first-half strike from Texas United Paul Gorish, his first of the season, to earn a hard fought draw at home. 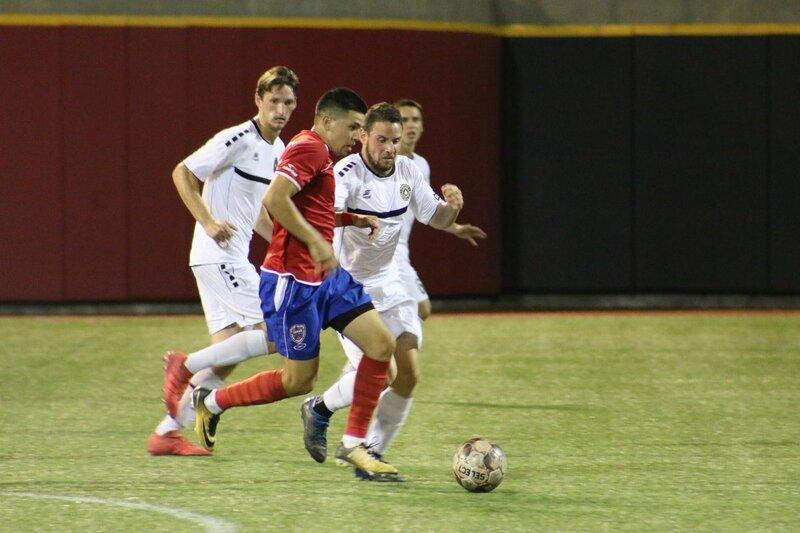 The Cavalry put themselves in the drivers seat for the Mid South title when they defeated defending champions OKC Energy U23 on the road Friday afternoon 3-1. Dynamo Academy product Marcelo Palomino scored the final goal with this Goal of the Week candidate. Texas United was playing their third match in a week and it showed when Energy U23 scored twice in the first three minutes. Texas United impressively clawed two goals back and tied the match when Caleb Smith and substitute Pierce Williams scored in the second half. Vlad Jandric’s game winning first goal of the season for Energy U23 came at an opportunistic time to keep their title hopes alive. Corpus Christi won a wild one, coming back from 3 goals down in their last home game of the season against the Royals. After the Royals had run up a 3 goal early lead, Patricio Botello’s hat trick in a 13 minute span on either side of halftime tied the match. The Sharks Ty Mobley then scored the game winner in the 65th minute. AHFC Royals played the final match of their inaugural PDL season, finishing 7-7-0.